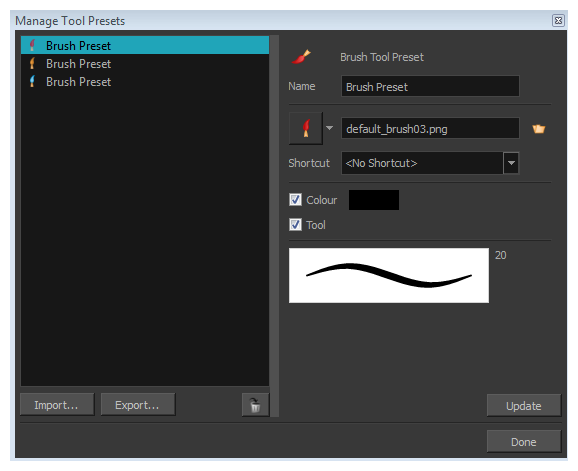 The Tool Presets window lets you create new tool presets and manage them. For more information on working with this window, see About Tool Presets. Lets you select a preset to manage. Lets you import an existing preset. Lets you export a preset for use in other projects. Removes the preset from the list of tool presets. Lets you change the name of the preset. Lets you assign a keyboard shortcut to the new preset. After adjusting the settings for a preset, the current properties are applied to the presets, as well as any other changes you made in the Manage Tool Presets window.